Two years ago our oldest daughter gave us a going away gift as we prepared to move from California to Oregon. 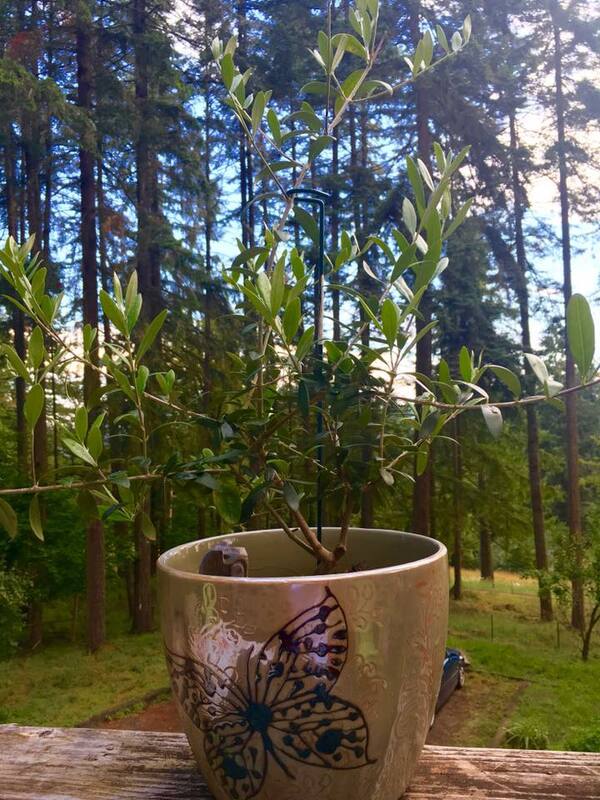 It was a beautiful gardening pot with a tiny seedling of an olive tree planted in it. For us it was the signature of God that it was time to go to our new home. Noah received an olive branch from the dove as a sign that it was time to leave the ark in order to establish his new home on the new land that was before him. When we arrived in Oregon our little seedling was not doing very well with the colder climate. Somehow it survived but it never grew. Two years has passed (as of June 13th) since we arrived in Oregon and for the first time that little seedling has begun to grow. It not only is growing but it is thriving! Like the butterfly on it’s pot it has gone from a caterpillar to a butterfly. This morning when I looked out at it, growing both high and wide, I felt the Spirit say that it is a sign of a time that His Church will thrive. We are already seeing a move of God that is healing the sick as well as a purification (sanctification) that has been purifying His people (the priesthood). As we seek His presence we will receive revelation, wisdom, healing and power which will cause the Church to thrive like our olive tree. A olive branch has been given to God’s people. It is a sign of hope and a sign of peace. He is pressing purified oil out of the olive tree (His people) in order to bring light and revelation to a lost and hurting world. Healing and power will flow forth from a purified priesthood that seeks His face and not His hand. It is time to receive your olive branch that announces hope to you today. Prayerfully consider donating to our ministry today as we are facing urgent needs at this time. Thank you! This entry was tagged breakthrough, Encouragement, faith, Hope, Jesus, kathipelton, kathipelton2016, Prophesy2016. Bookmark the permalink.